By making a booking with Snozone it is assumed that you have read and accepted the following terms & conditions. We reserve the right for our team to ask you to leave the slope and the premises if you do not abide to the Terms and Conditions outlined below. In such cases, no refund will be given. We advise that you pre-book as time on our snow slope is subject to availability. You can book on site at the reception desk, or online at www.snozoneuk.com. Snozone reserves the right to refuse admission without refund or transfer. If you need to cancel or alter your booking, we require a minimum of 72 hours notice to allow for a refund. If your booking needs to be transferred, Snozone requires a minimum of 72 hours notice and this must be rebooked within 30 days of your initial activity date. This will be subject to Snozone’s lesson availability. A transfer to the following month will incur a £5 transfer fee per person. Snozone asks you to arrive 45 minutes before your activity starts. If you are not ready with your clothing and equipment within 5 minutes of the activity start time, Snozone reserves the right to refuse you admission as you will miss the health & safety briefing. Snozone will endeavour to reschedule your lesson for the same day, however if this is not possible, we will try to transfer you to another date within a 30 day period. The £5 fee will still be applicable. We will do everything that we possibly can to accommodate your late arrival but sometimes this may not be possible. Our programme times are fixed so that we can let our Coaches know their working patterns. We require everyone who wishes to use the main slope for ‘recreational use’ to be of a minimum standard unless attending a lesson or accompanied by a Snozone Coach. You should be able to control your speed, conﬁdently link your turns and fit your boots correctly. You must also be fully competent in using the poma lifts. If you are unsure about your ability or have any questions regarding minimum standards please visit our website under the ‘lessons section’ where this is defined in full. Snozone accept no responsibility for damage to equipment or clothing or personal injury whilst undertaking any activity within the Snozone building. To ensure the safety of all slope users, no-one other than our fully qualiﬁed Snozone Coaches are permitted to teach or provide coaching on our slope. Should anyone be found coaching or soliciting for clients to coach who isn’t a Snozone Coach, or without clear prior approval, they will be asked to leave the slope and the building and either suspended or expelled from Snozone. Our expert team will endeavour to deliver all the skills listed for each lesson stage, however skills attained may be dependent on your personal rate of progression or that of others in your group and it is very important that we don’t over-accelerate your learning before you’re ready to move to the next level. If you need to rebook a lesson for some additional coaching, we offer a 15% discount for bookings made on the same day as your original lesson. Skis, sledges and snowboards are included within the ticket price of your activity – and helmets are provided for all our customers. Ski boots and snowboard boots are also provided for skiing and snowboarding lessons and coaching. It is compulsory for all guests aged 16 and under to wear a helmet at all times. For sledging activities, boots and gloves are not provided and we recommend either a change of shoes or wellington boots. All guests must wear helmets at all times when undertaking any form of coaching, sledging, or any form of high impact activity including freestyle. You are welcome to bring your own ski/snowboard equipment and if you do so there is a reduced price to pay. For safety & comfort, gloves, full length trousers & long sleeve tops must be worn at all times on the slope. We advise that you wear waterproof jackets & trousers, which can be hired from our reception desk. For hygiene reasons, gloves & socks are not available to hire, but can be purchased at our on-site shop for a very reasonable price. Gloves are compulsory for all activities. There is no dedicated spectator area on the slope, but we do have an excellent viewing area within our Alpine Kitchen restaurants. We are happy for slope users to take your own photographs but you must be confident that you are not causing a hazard to other slope users when stopping to film or take photographs. We reserve the right to ask you to cease photographing or filming at any point for any reason. Please be advised that we have CCTV throughout the centre for the purposes of crime prevention which complies with the Data Protection Act 1998. In addition, we may record your images for advertising &/ or marketing purposes.It is sometimes the case that third parties -including the media- record images of events at Snozone. In such circumstances notices will be displayed to advise customers of any ﬁlming / photography to be carried out where your image may appear. We love to share the enjoyment of watching people of all skills and ages out on the slope. As a result, photographs and/or videos may be taken throughout the events we have from time to time. The organisers have full rights to use the images resulting from the photography/video filming, and any reproductions or adaptions of the images for fundraising or publicity. This might include (but is not limited to), the right to use them in their printed and online publicity, social media, press releases and funding applications. If you do not wish to be photographed please inform a member of our team. If you have a medical condition or a disability that may affect your safety or the safety of other slope users, you must inform a member of the Snozone team prior to booking. For the safety of our team and guests, Snozone reserves the right to ask anyone to leave the slope and the premises if we believe them to be under the inﬂuence of drink or drugs, behaving irresponsibly, endangering other slope users or being abusive to other slope users. We have a zero tolerance policy towards our team members being abused, threatened or mistreated either in person or via social media. Should any such matter arise, we will inform the police on all occasions and always pursue legal action. Parts of the slope may be sectioned off at times for special events, sledging activity, essential maintenance work or to allow freestyle features to set. Please check before booking for up to date information on forthcoming activities or closures. Details are also listed at www.snozoneuk.com. All activities and prices are correct at time of going to press, however Snozone reserves the right to make changes at any time. Children under the age of 16 must not be left on the premises by themselves at any time. If this is found to be the case, Snozone may inform the police immediately. Children under the age of 12 participating in snowsports activities must be supervised on the slopes by an adult at all times – please note that minimum standards apply for main slope use. For the safety of children, if ski or snowboard proficiency has not been attained, parents and/or guardians will need to be available to collect from the slope immediately. 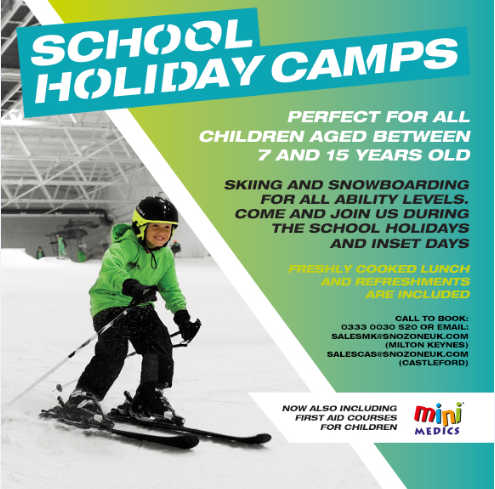 Snozone will only allow children on their sites without a parent/guardian, in Snozone’s designated School Holiday camps and SnoAcademy. Only food & beverage bought from Snozone’s own restaurant and bar is allowed on the premises. All other food & beverage must be consumed away from Snozone’s premises. Guests will be asked to leave the premises if this request is not adhered to. Membership cards must be presented at all times for the member to enjoy the benefits of membership. Membership cards are strictly non-transferable. If membership cards are transferred, the membership will be terminated. Please see the membership terms and conditions for further details. These terms and conditions apply to all events booked at Snozone. Prior to any member of your group participating in any slope-side activities you must advise us of any medical conditions you feel we need to be aware of, or any assistance that may be required. All bookings must be confirmed in writing and by accepting our terms and conditions. If written confirmation is not received within 21 days of the event Snozone reserves the right to cancel the booking. If any damage is caused inside the facility Snozone reserves the right to hold any bar deposits to cover the cost for the damage caused. A 50% deposit is payable once an event is confirmed. Full payment is due 14 days prior to the event by credit card, cheque or BACS Transfer. Cheques should be made payable to ‘Snozone Ltd’. Invoices & Receipts can be raised/sent as required. Should payment not be received in accordance with these terms, the booking will be at risk of cancellation. Should a booking be confirmed within 14 days of the event date, payment will still be required prior to the event. If you do not, or are unable to attend your event, or arrive late, for any reason, you will still be charged in full. In the event of extreme circumstances preventing you to attend, 50% deposit will be non-refundable, and at Snozone’s discretion it may be possible to transfer your event within the same calendar month. If payment is received prior to written confirmation of the booking being returned this is deemed as acceptance of these terms and conditions. Any variance to these terms and conditions must be agreed with Snozone, in writing prior to the event taking place. Our summer special offer price discounts are based on our standard peak pricing originally charged between 1st October 2017 and 23rd April 2018 and are valid until midnight on Sunday 30th September 2018. Discounted products must be booked and redeemed by the 30th September.